Clashes break out as demolition teams destroy improvised homes of migrants hoping to reach UK. The French government says that it is sending demolition units to the northern port of Calais to take apart improvised shelters housing migrants. The area is known as the "Jungle" and is primarily inhabited by people from the Middle East, Africa and Afghanistan. It has also been the site of numerous clashes between migrants and police. Last night (Monday) about 150 residents, some armed with iron bars and rocks, reportedly attacked police and threatened passing vehicles. It is not known how many people are living in the Jungle. Authorities say there are about a thousand, while support agencies say there are at least 3,500. Most have not requested asylum status because they hope to reach Great Britain and do so there. Many hire human traffickers in the hopes of illegally crossing the English Channel. 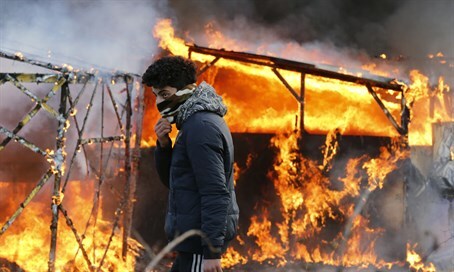 Volunteers with the British group Help Refugees say that tear gas canisters shot by riot police have caused several shelters to burst into flames, while residents set others on fire as a form of protest. Officials claim that they are performing a “humanitarian operation” by moving the migrants into nearby shipping containers. They add that schools and houses of worship will not be touched. Amnesty International has warned that both France and the UK must uphold their responsibilities towards the Jungle's residents, including helping them apply for asylum in France and offering British visas to those with family in the UK. “Although it’s taking place across the Channel, this is not an issue that the UK can wash its hands of,” said John Dalhuisen, the organization's director for Europe and central Asia.